We invite you to join the GWSW proposal-writing community to receive the latest funding agency updates, grant proposal writing tips and Q&A, information on how to write high-impact research manuscripts, and more. GWSW Workbooks offer comprehensive, step-by-step instruction for creating proposals for a variety of funding agencies. On October 30, 2017, the National Science Foundation issued a revised version of its Proposal & Award Policies and Procedures Guide (PAPPG) (NSF 18-1) for all proposals due on or after January 29, 2018. The January 2018 edition of The Grant Application Writer’s Workbook – NSF Version has been updated to comply with the revised PAPPG. When I was a graduate student, one particular research group caught my attention because they seemed to publish a manuscript at least monthly. It didn’t take long, however, for me to appreciate that all of their publications were very similar; it was only the Results Section that changed substantively from one publication to the next. At virtually every Biomedical Publication Seminar I present, attendees line up during breaks to seek my input on conflicts they are currently facing regarding authorship. Thus, if you find yourself struggling to decide who should or shouldn’t be included as an author of a manuscript, you’re not alone. Should I recommend a reviewer for my manuscript? Data show vs data shows – which is correct? Will a panel reviewer actually read my grant application? The future for biomedical PhDs – significantly less than promising? NIH Impact Factor 26 (34%) NOT FUNDED – What do I do now? Ask the Experts – NEVER let this happen to you! Effective January 25, 2019 and January 28, 2019 there have been changes in the way that grant applications to NIH and NSF, respectively, are written and reviewed. The 2019 version of The Grant Application Writer’s Workbook – NIH version has been updated and is available for purchase now. 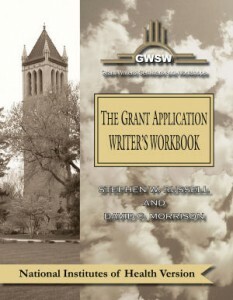 The Grant Application Writer’s Workbook – NSF version has also been updated and is available for purchase now.